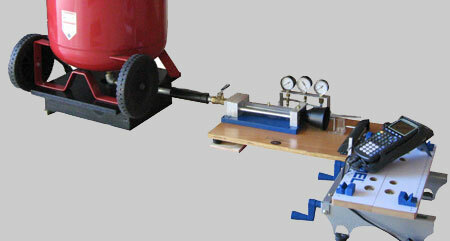 The AeroRocket subsonic wind tunnel is a suction system powered by a two speed 1/3 horsepower fan. The test section is 7 inches wide x 10 inches high x 16 inches long. 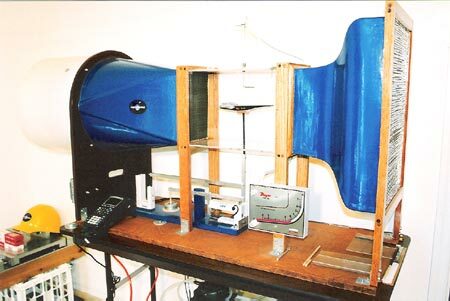 The basic subsonic wind tunnel design is by Donald D. Baals of NASA and was fabricated and redesigned by John Cipolla. 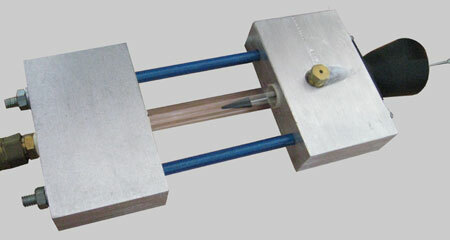 A research quality pitot tube is used to measure the difference between static pressure and dynamic pressure in the wind tunnel. 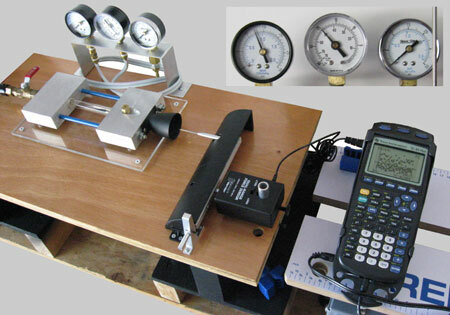 An analog velocity meter is used to convert the resulting pressure differential between the static and dynamic pressure to determine test section flow velocity in feet per minute. Recently, the insertion of aluminum honeycomb material before and after the test section resulted in a significant increase in measurement accuracy for drag and lift coefficients by decreasing flow turbulence by several orders of magnitude. When testing small wind tunnel models, AeroRocket uses aerodynamic scaling laws to convert data from inexpensive wind tunnel models into design information for very expensive large scale prototypes. In practice the aerospace industry giants do not build an expensive multi-million dollar airplane and then attempt to see if the aircraft has enough lift to fly and is stable enough to avoid crashing. Instead, they measure lift and center of pressure on small models and use scaling laws to predict lift and stability of the full scale prototype. 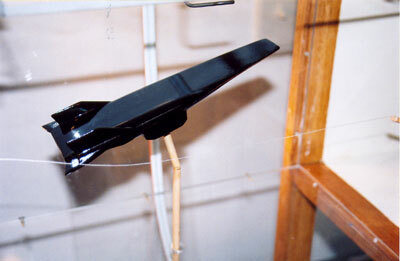 Wind tunnel models have been tested in small wind tunnels to determine the aerodynamics of every aircraft from the Wright Brothers first airplane to the NASA Space Shuttle. Therefore, it is insulting for an individual or corporation to request that AeroRocket test for example a full size motor cycle in the AeroRocket subsonic wind tunnel while knowing the test section is about as big as a breadbox and then in the same telephone request insult the AeroRocket subsonic wind tunnel for its small size. For their ignorance these individuals and corporations can take their wind tunnel testing business elsewhere. 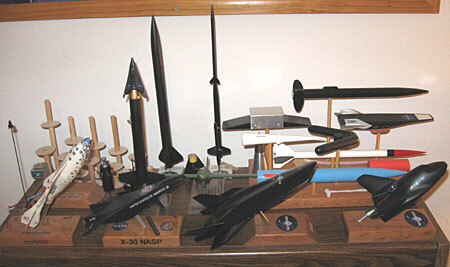 An example of testing a complex aerodynamic prototype in the AeroRocket subsonic wind tunnel is the Schafer Corporation V-Ship, second model from the left illustrated above. While the V-Ship model is only 3.5" long the AeroRocket subsonic wind tunnel accurately modeled the laminar aerodynamics of the 60 foot long airship when operating at 70,000 feet. Therefore, models of very large designs may be successfully tested in the AeroRocket wind tunnel at relatively high Reynolds number as long as the flow is assured to be either laminar or turbulent depending on the actual characteristics of the full-scale flow. 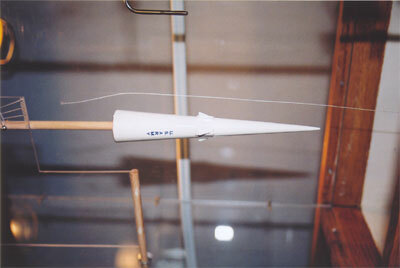 Small models that represent large designs are routinely tested in the AeroRocket wind tunnel because aerodynamic shapes including plates, spheres and cylinders exhibit relatively constant drag coefficient (CD) over a wide range of Reynolds number as long as the flow is turbulent or made turbulent using an attached trip wire. In the illustration below, please notice that a 2-D plate normal to the flow has a relatively constant CD for Reynolds number ranging from approximately 1,000 to nearly seven million. Similarly, cylinders have relatively constant CD for Reynolds number ranging from approximately 1,000 to nearly one million. The phenomena of constant CD over a wide range of Reynolds number is also valid for 3-D flow and is caused by the transition to "forebody" turbulent flow at Reynolds number 1,000 and NOT any effect the base-region turbulent boundary layer has above the critical Reynolds number for reducing base drag. This principal can be extended to many other complex designs where shape and Reynolds number must be maintained for valid wind tunnel results based on flow similarity. Please read Fluid Dynamic Drag by S.F. Hoerner, pages 3-7 to 3-15 for more explanation. Drag (CD) verses Reynolds number (Re) for 2-D flow over common aerodynamic shapes. A new supersonic blow-down wind tunnel is available for testing aerodynamic shapes from M = 0.5 to M = 3. The AeroRocket supersonic blow-down wind tunnel is the result of an urgent need to replace the previous shock tube wind tunnel with a more robust and cost effective system to measure projectile drag coefficient (Cd). The shock tube proved to be extremely expensive to operate while producing results that lasted only a few milliseconds making Cd measurement extremely difficult. The new AeroRocket blow-down wind tunnel achieves nearly constant Mach 3 flow for approximately 4 seconds, then quickly transitions to nearly constant Mach 1.37 flow for another 4 seconds during the blow-down process. As a result standard and inexpensive off-the-shelf data acquisition devices can be used to measure long duration drag forces for determining Cd verses Mach number. 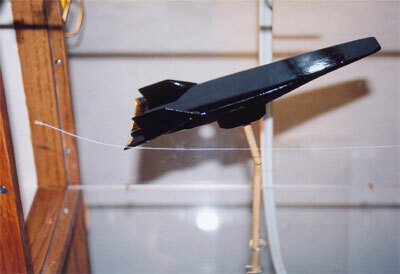 The supersonic blow-down wind tunnel has been calibrated using the supersonic Narrow Wedge relationship for Cd verses Mach number from Fluid Dynamic Drag by S.F.Hoerner. The converging-diverging nozzle featured in the new supersonic blow-down wind tunnel was designed using Nozzle 3.7 and classical analyses to use the concept of a normal shock diffuser to increase pressure ratio efficiency. The normal shock is slightly upstream of the divergent duct and completely enclosed by the exhaust nozzle. This system is operational for supersonic wind tunnel testing. AeroRocket's expertise in the fabrication of miniature wind tunnel models makes possible the measurement of transonic and supersonic Cd for designs ranging from relatively simple high power rockets to the HTV-3X. However, shape limitations apply because of the small size of the wind tunnel models required to fit in the test section. Supersonic blow-down wind tunnel operating at Mach 2.96. TI-83 used to generate curve-fit equation for drag force verses time. 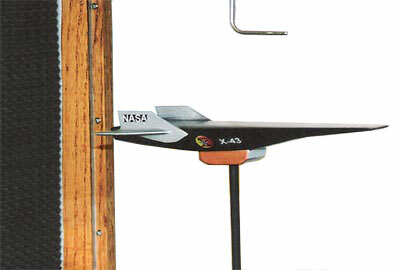 Wedge calibration wind tunnel model mounted on a sting to measure drag force and Cd. 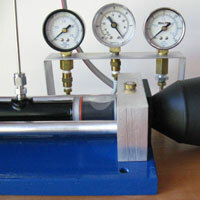 Mach 2.96 flow from Time = 0 to 4 seconds and Mach = 1.37 flow from Time = 4 to 8 seconds during blow-down. The following case illustrates the measurement of drag coefficient (Cd) at Mach 2.94 for a shape similar to the Mars Phoenix entry capsule. The Cd determined by the AeroRocket supersonic blow-down wind tunnel test is Cd = 1.390. To account for sting base drag interference the following equation from Fluid Dynamic Drag is used to correct for sting base drag effects. Cd_base = K*1.43/Mn^2 where K equals 0.7. Base drag is determined by this equation to be 0.116. Total Cd for the entry capsule is Cd = 1.506 as tested in the AeroRocket supersonic blow-down wind tunnel. Drag coefficient of a conical capsule of the type tested here has been tested before and may be found in NACA TN D-1085 (1963). The value for drag coefficient for the capsule tested in the NACA report is Cd = 1.49. These results may also be found in Fluid Dynamic Drag on page 18-19 in Figure 33. A new supersonic blow-down wind tunnel is available for testing aerodynamic shapes.The new 1" inside-diameter supersonic blow-down wind tunnel, having a test section blockage factor less than 3%, now joins the successful 1/2" supersonic wind tunnel. Tests conducted using the next generation wind tunnel indicate drag coefficient (Cd) for the HTV-3X is 0.1016 at Mach 2.64. 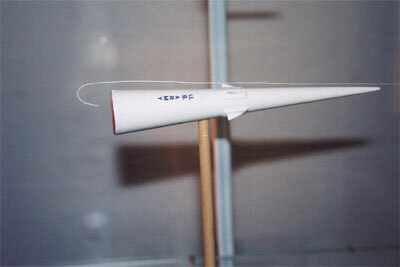 Next generation 1" diameter supersonic blow-down wind tunnel with air supply. 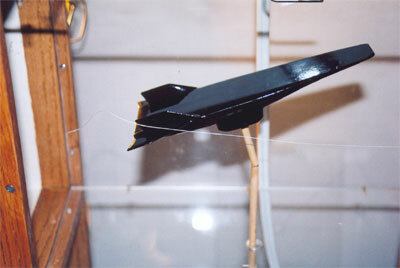 HTV-3X mounted in the 1" diameter supersonic blow down wind tunnel. used to determine Mach Number in the Supersonic Wind Tunnel. 1/2" Diameter Wind Tunnel: Mach number verses time is measured during the blow down process using a pitot-static pressure probe for measuring total pressure (Po) and static pressure (Ps) of a compressible fluid (air). 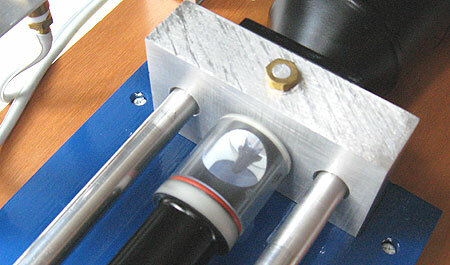 Click here to view a QuickTime movie of a 6.0 second segment of a wind tunnel test using the 1/2 inch diameter AeroRocket supersonic blow down wind tunnel. The image below displays Mach number verses time using total and static pressure results from pressure testing. In this test nearly constant Mach 2.0 flow is maintained for approximately 6.0 seconds. 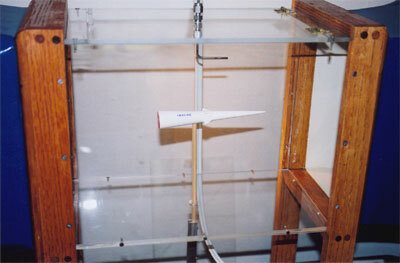 1" Diameter Wind Tunnel: Mach number verses time is measured during the blow down process using a pitot-static pressure probe for measuring total pressure (Po) and static pressure (Ps) of a compressible fluid (air). Click here to view a QuickTime movie of a 2.5 second segment of a wind tunnel test using the one inch diameter AeroRocket supersonic blow down wind tunnel. The image below displays Mach number verses time using total and static pressure results from pressure testing. 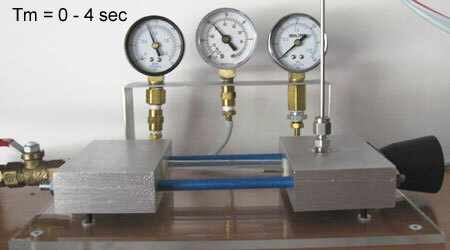 In this test nearly constant Mach 1.6 flow is maintained for approximately 2.5 seconds. Wind tunnel measurements at a maximum wind speed of 80 ft/sec (54.5 mph). 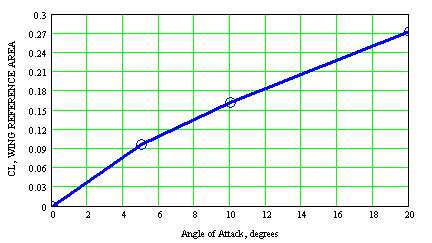 Drag (CD) and lift (CL) at 0, 5, 7.5, 10, 12.5, 15 and 17.5 degrees AOA using vertical-sting or rear-sting mounted models for angles of attack ranging from 0.0 degrees to 40 degrees AOA. 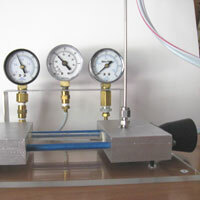 Center of Pressure location (XCp) measurement. Flow visualization using probe-mounted yarn filaments or smoke that define areas of reverse flow and vortical motion corresponding to lift. Turbulent flow measurement using trip-wire if required. 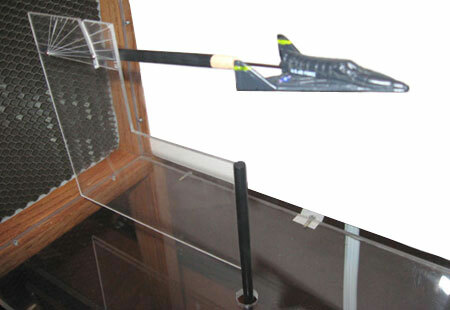 Figure-1 illustrates the force balance system used to determine rocket drag (CD) and lift (CL) of a wind tunnel model mounted on a vertical-sting. Displacement in the axial (drag) and vertical (lift) directions are measured using the two load cells labeled DRAG and LIFT respectively and then converted to drag and lift forces in Newtons using the Vernier CBL-2 computerized data acquisition system. The force balance system pictured in Figure-1 is designed to separate the aerodynamic forces and the associated displacements in the axial and vertical directions when the weight on the force-balance plate causes the model to be freely suspended. 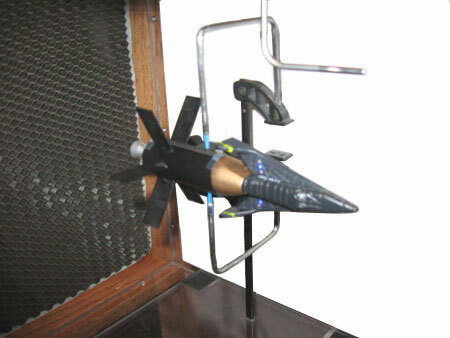 Models tested in the AeroRocket wind tunnel may be mounted on a vertical-sting as in Figure-2 or mounted on a rear-sting as in Figure-3. Either mounting configuration may be selected depending on the objectives of the wind tunnel test. Center of pressure location measurements are performed using a special XCp-Caliper that secures the model in the wind tunnel test section using two opposing low friction points. 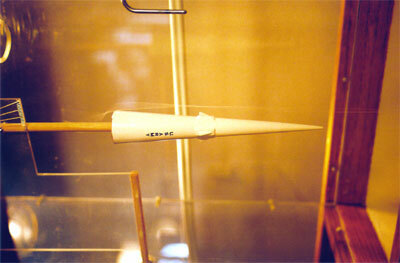 Figure-4 illustrates a ring-fin model rocket being tested in the AeroRocket wind tunnel for the determination of center of pressure location. The ring-fin model in this configuration is stable because the support point is ahead of the actual center of pressure. The actual center of pressure location (XCp) is determined by moving the sting support location rearward until the model becomes unstable and "noses over" to one side or the other when the wind tunnel is operating. Figure-5 further illustrates how the ring-fin rocket model is secured in place during center of pressure location testing. 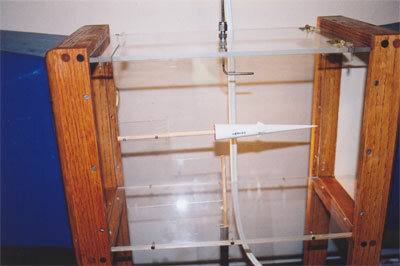 Please notice the pitot tube used to measure the difference between static pressure and dynamic pressure for determining flow velocity in the wind tunnel. 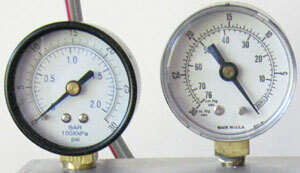 An analog velocity meter is used to convert the resulting pressure differential to test section flow velocity in feet per minute (fpm). A single-strand filament of low mass yarn on a long slender probe illustrates the flow on and around an object. 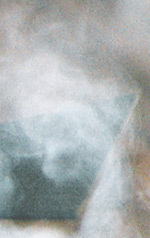 Regions of reverse flow behind blunt bodies become visible. Please refer to Figure-6, Figure-7 and Figure-8 to see how the base flow of the Sprint ABM is investigated using a yarn tuft on a probe. In addition, regions where the flow rotates indicate stream wise vorticity and therefore lift and circulation. Please refer to Figure-9, Figure-10 and Figure-11 to see how the fin-tip vortical flow pattern of the X-43 at an angle of attack of 15 degrees is investigated using a yarn tuft on a probe. Please note the three photographs of the X-43 are of the yarn filament as it rotates in the clockwise direction as viewed from the front of the wind tunnel model. A smoke generator and blower are used to test models outside the AeroRocket wind tunnel. Larger models may be accommodated because the smoke visualization tests are conducted without the constraints of the relatively small dimensions of the AeroRocket wind tunnel's test section. Figure-12 and Figure-13 display the vortex flow pattern from the leading edge of a 60 degree triangular wing.